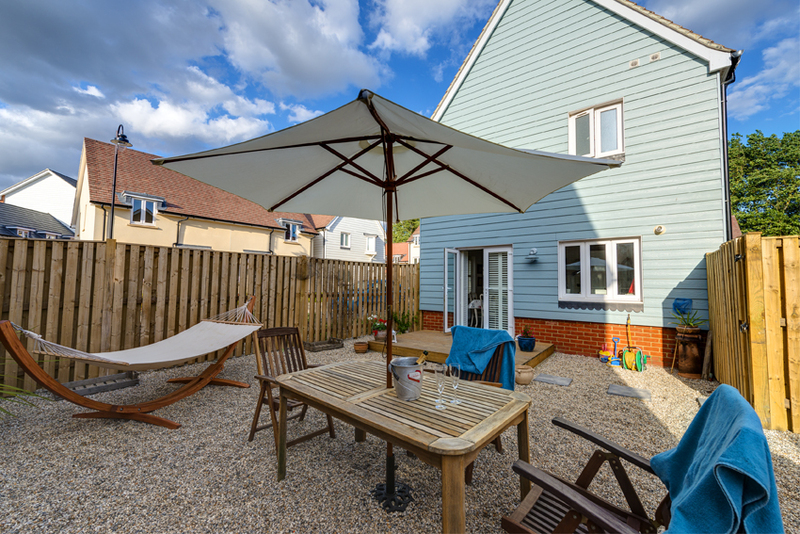 Half Moon Cottage is an adorable, sea-blue holiday cottage just a five-minute walk to the wide open beach at Camber Sands. 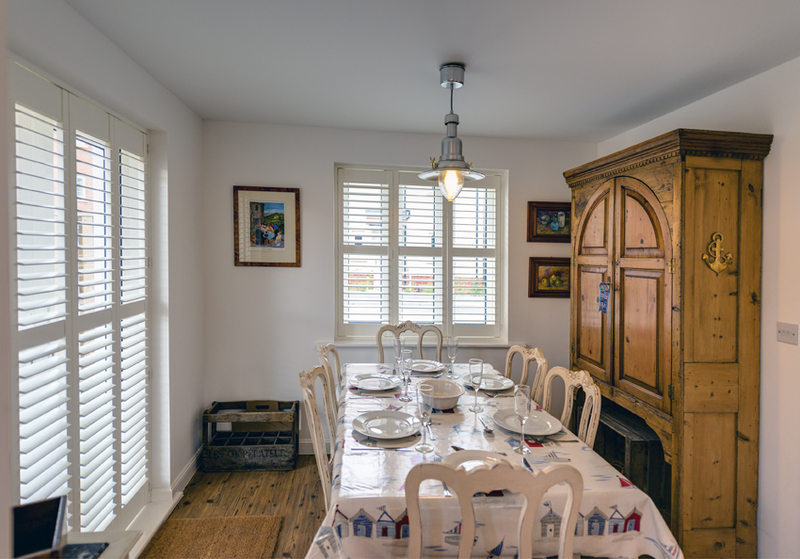 With a fully enclosed garden for al fresco dining and three lovely, comfortable bedrooms, Half Moon Cottage is an ideal retreat for families—and you can even bring the family dog. Let your pup explore the fenced garden while you recline on the hammock or sear dinner over the three-burner gas grill. 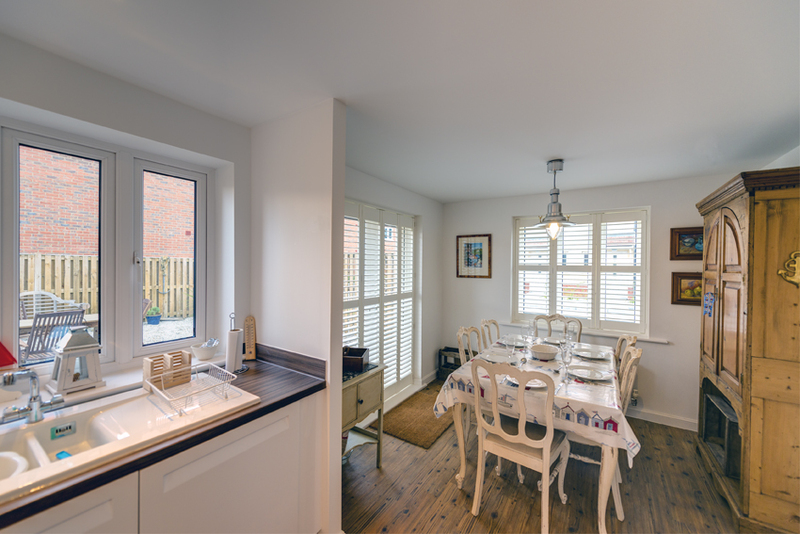 The White Sand development in Camber Sands is a quaint, residential cottage community just 5 miles from Rye and just over the dunes from the beach. Breathe in the sea air and explore the best of 1066 Country just beyond your door! On the ground floor, socialise in the bright sitting room with a large flat screen TV with DVD and a collection of books—a great Plan B if the sun doesn’t shine! Just add an espresso from the Nespresso machine (with espresso pods provided!) and have a cosy afternoon in. 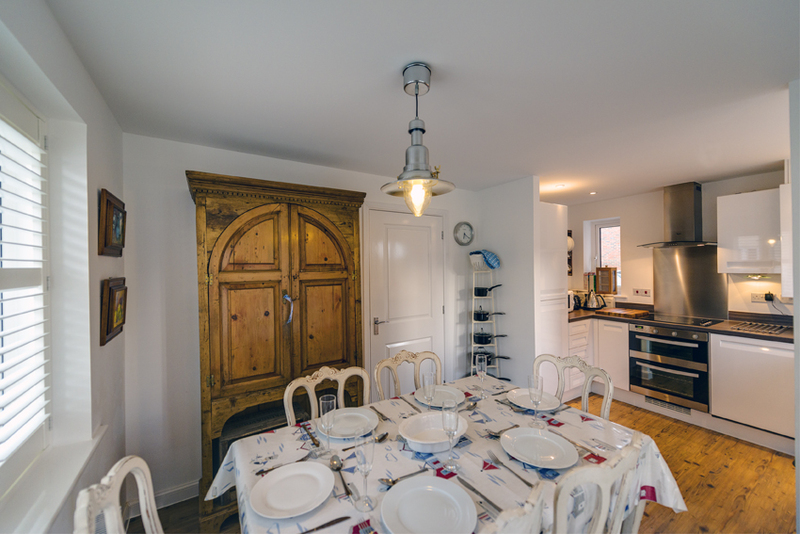 Dinners at home are easy thanks to a fully equipped kitchen and a dining area with a large table for six. Or take the meal out to the garden patio’s six-person, shaded table. On the first floor is a large master suite with a double bed and an en-suite bathroom with shower, WC, and basin. The second bedroom has two single beds, and the third has one single bed. 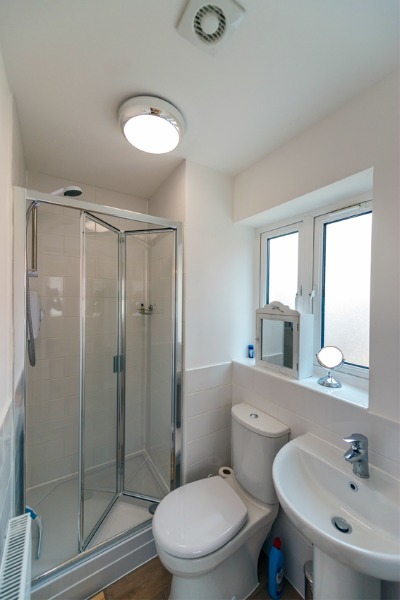 These two bedrooms share a family bathroom with bath and shower over, basin and WC. Enjoy the sea air in the fully enclosed pebbled garden with a decked patio area. 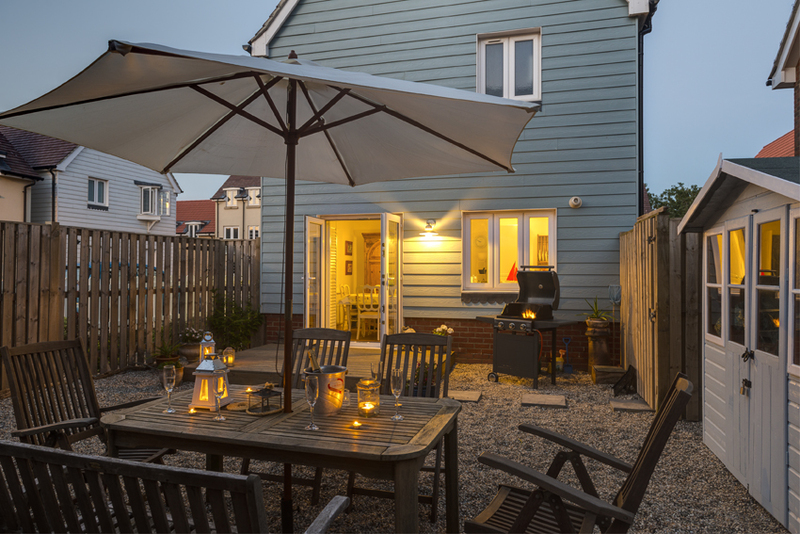 Lounge on a luxury hammock, cook dinner over the gas grill, and uncork a bottle of wine to sip at the shaded dining table as the moon rises overhead—the perfect end to the perfect day in Camber Sands. Whether you’re looking to build sand castles with your children or help them explore fascinating rock pools, Camber Sands offers the country’s most spectacular sandy beach and paddling-friendly waters right on the doorstep of Half Moon Cottage. 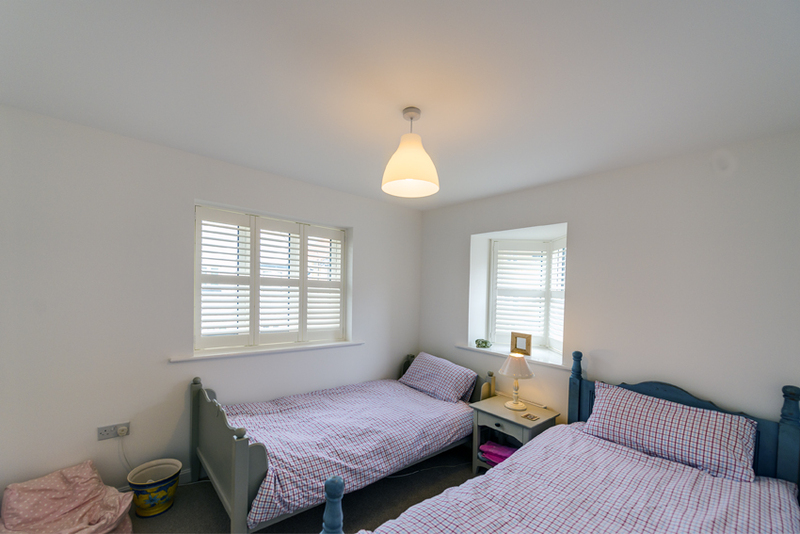 Holidays with young children and toddlers means lots of bulky luggage, high chair, travel cot etc, so to ease the load Half Moon Cottage has been specially equipped with baby friendly features such as a high chair, stair gate, & travel cot. Dogs love a big sandy beach – space to run around, sand dunes to explore, water to splash in, interesting smells to discover and plenty of other dogs to play with. So when you bring your four-legged friend to Half Moon, it’s good to know that the incredible dog friendly Camber Sands beach is right on your doorstep. They will be in hound heaven! Our dog friendly Camber Sands holiday cottage, Half Moon here at White Sand is the perfect place to bring your faithful furry companion. Camber’s huge sandy beach on your doorstep, lots of great places to go for walks and even dog friendly pubs so that you can both enjoy a relaxing drink after a day of sniffing about on the dunes! 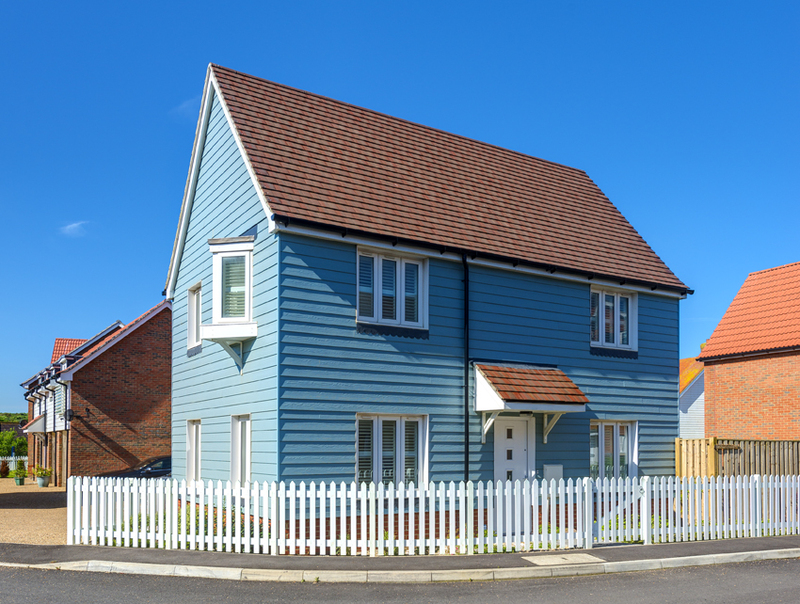 With the blend of tradition and culture in Rye and the beauty and tranquillity of Camber Sands, Half Moon is ideally positioned to enjoy the very best this unique corner of England has to offer. Our family had a wonderful stay. The house was the perfect location for all of us to blow of city steam on the most wonderful beach. The children (and us) came back exhausted but exhilarated. Can’t reccomend the cottage enough – super cosy for our family of five, and with lots of little added touches to make the stay very comfortable. A Even milk in the fridge and welcome treats of a delicious cake and macaroons. Thank you so much Ricahrd and Sophie for the brilliant service. We had a lovely couple of nights at Half Moon Cottage. The house was spotlessly clean and perfectly equipped for 4 adults and 2 toddlers. It’s in a great location, close to Rye and a short walk to beautiful Camber Sands. Richard & Sophie were so helpful and even left a delicious cake, which was very appreciated! Overall a great house in a great spot, highly recommended. On arrival at the cottage we immediately felt at home. There was a delicious cake and a bottle of locally produced apple juice to welcome us. The cottage is well equipped, comfortable and clean. We stayed for a week with our dog and had various members of the family stay over.it was even warm enough for a BBQ in the shingle garden. Everyone loved it and we had some fantastic walks on the beach and along the estuary to Rye. Everyone is very friendly and dogs are welcome almost everywhere! Although Richard & Sophie are on hand at all times we had no need of their services until we returned home and I realised i’d left my laptop behind. A quick phone call to Sophie and I was immediately reassured that laptop would be safe until i could arrange its return. What a great team! Great location! Close to beach and good cycling routes. The cottage was modern, very clean and well equipped, we all really enjoyed our stay. What a superb stay at Half Moon Cottage! My boyfriend, dog & I stayed here for 5 days and we really didn’t want to go home! 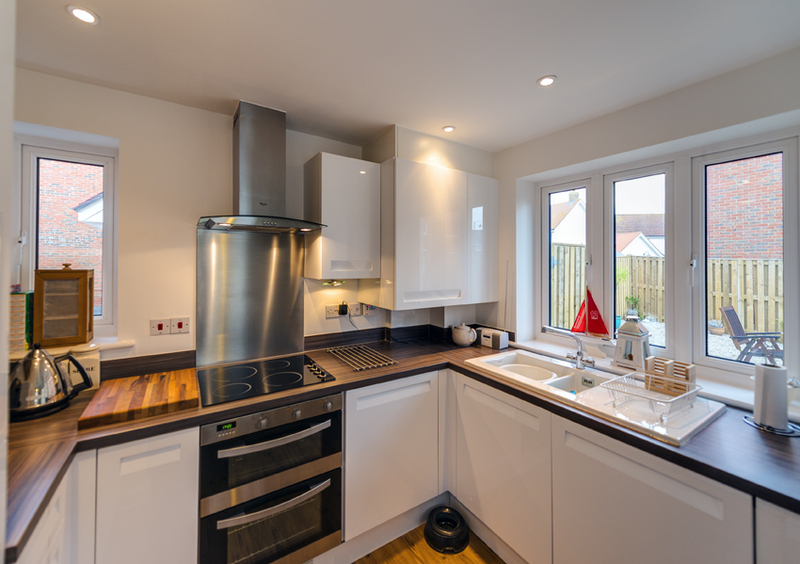 The house was a tastefully, well equipped home from home with 3 bedrooms, a separate bathroom, an ensuite shower room, a lovely living room and an excellent kitchen that opened out onto a wonderful, secure, pebbled back garden. All our creature comforts were cattered for throughout the house to a very high standard… fluffy towels, comfy beds, nespresso machine, big fridge/freezer, plenty of useful crockery & pots & pans should you wish to cook, a hair drier & straighteners, an excellent book collection and even a big BBQ with a charcoal supply. We had superb weather and the garden which was a sun trap had a large table, hammock, gas BBQ & fire pit. The fencing was also extremely secure so we didn’t worry that our dog would get out. However if the weather wasn’t good there is a large TV with DVD player and there is wifi internet access. 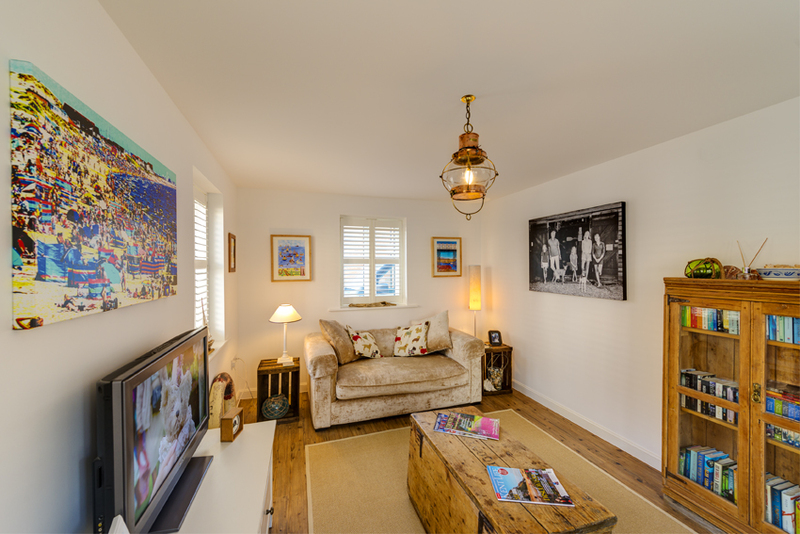 The house is perfectly located being 5 minutes walk to the beach and a mere 10 minute drive to Rye where there are loads of fun shops and great places to eat – many of which welcome dogs too. I highly recommend Half Moon Cottage and can’t wait for another visit! A lovely property and just a few minutes walk from the beach. It is in a quiet drive and has a secluded garden with BBQ. The kitchen is well stocked and bedrooms a nice size. It has a great feel throughout and our dog (like us) did not want to come home! Absolutely loved this house, well equipped, well presented and nice and cosy. We had a fabulous week although weather let us down a bit but didn’t stop us enjoying our time here. Lovely welcome pack when we arrived, we had to go to the farm shop to buy more of the apple juice, it’s the best we’ve ever tasted! The beach at Camber Sands is outstanding, so beautiful. The surrounding areas are quite interesting with the strange eeriness of Dungeness, The Pilot Inn at Dungeness does the most amazing fish and chips! Would definitely recommend a stay and will be returning in the near future. Thank you for having us. 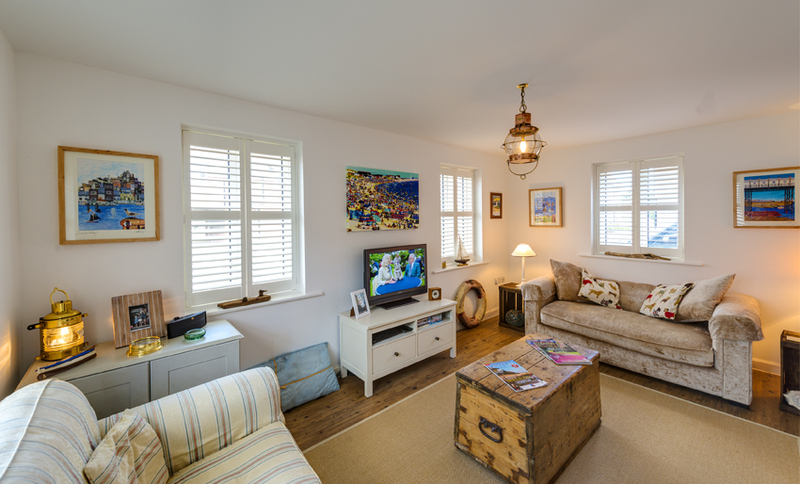 Half Moon Cottage is a stunning little home superbly located for lazy days on the vast sandy beach nearby. We have had the most amazing time staying there! The cottage and garden is so pretty and abundant in comforts but also really practical! Every detail has been thought of to make your stay easy and relaxed. From a pit fire to roast marshmallows to a low swinging hammock to daydream on, sumptuous duvets and throws, a full book case of holiday reads, and a well-equipped BBQ and kitchen!! The beautiful Camber Sands are a 5 minute walk away, whilst the local town, Rye, has the most amazing food offerings – we followed nearly all of Richard’s and Sophie’s recommendations and they were spot on every time! We had a delicious scallop lunch at The Standard, the cleanest & tastiest fish and chips at Marino’s, crisp English wine at Chapel Down Winery and very sweet hot chocolates at Knoops! Another great place is Rye Bay Fish, who have the freshest and tastiest fish on sale every day – and are really friendly and helpful! On arrival there was a lovely welcome pack, and Richard and Sophie were on hand whenever we had questions or queries. We came away feeling really refreshed – and are looking forward to when we can visit again! We had a fabulous time at Half Moon Cottage. What a lovely place, comfy, welcoming and beautifully appointed. 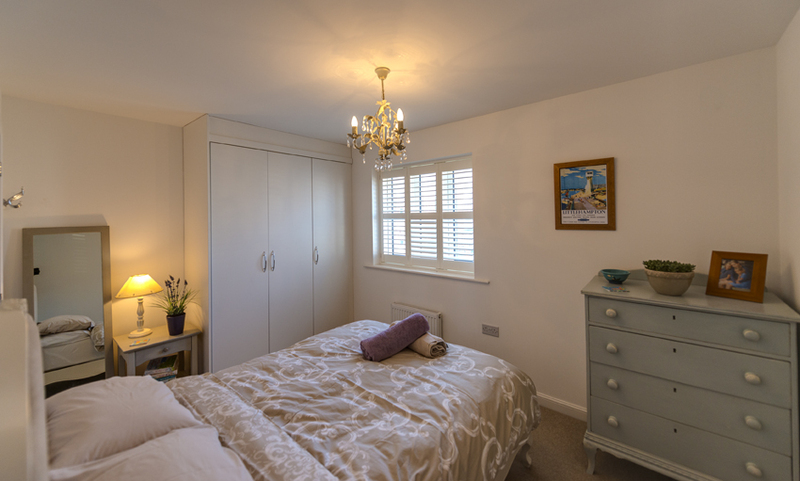 The cottage is a only a few minutes walk from the fantastic camber beaches. And it’s a short trip into Rye where we sampled some delicious local scallops & found some very welcoming hostelries. We certainly hope to return as soon as possible! We were a group of girls staying for a short weekend hoping to escape from London life. This house was absolutely perfect for what we wanted. The house itself was really pretty, felt very homely and was very tidy. We were given a lovely welcome pack which was really appreciated. The house is in an excellent location close to the beach and there was a helpful information booklet for the local area and things to do. Thanks so much! We have just had an amazing stay in this cottage with our 3 children 12,11 and 8. Situated 5 minutes walk from the beach and a quick drive to Rye we had everything on the doorstep. 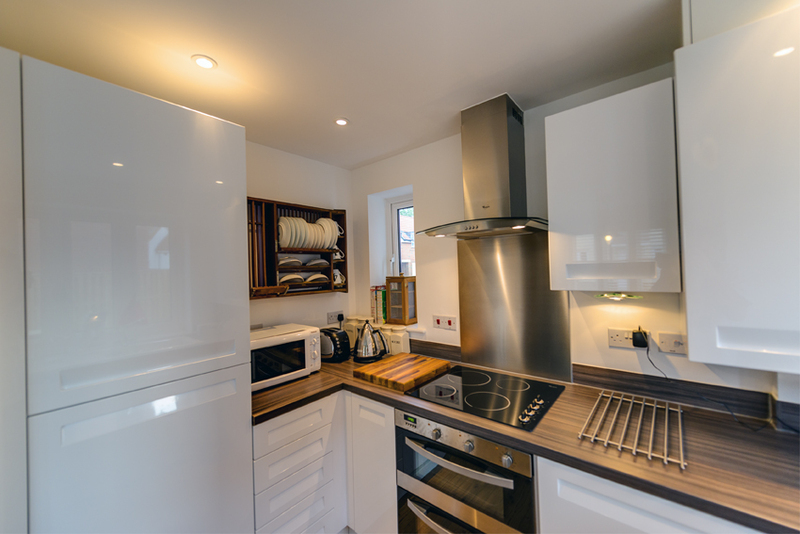 The cottage is exceptionally clean and has everything you need. A washer and dryer are really handy and a great sized fridge. There is a fantastic hammock in the garden for everyone to rush too and a very large shed to store bikes and beach gear. Parking is very easy and a back gate means no carrying through the house and easy unpacking of the car. We ate out a lot as Rye has amazing pubs,restaurants and even a cinema. Everywhere let us take our dog which meant we had a true family holiday. Wifi was fine for us and husband managed to keep up with work daily with no complaints. We have always gone to Cornwall and loved the seaside but after staying in this lovely cottage and on this beach we will be back. You really don’t have to go in the car at all but Kent is also very near and we did go on a day trip to Bovey Castle which was fantastic. Our children have had a fantastic week and so have we. Rye is so worth a visit and they have some beautiful shops.Thank you for letting us stay in your cottage it is truly great. We stayed at Half Moon Cottage for a week in the Easter holidays. We are a family of four including two teenagers.The house was comfortable and nicely furnished. We were extremely lucky as the weather was fantastic and we were able to spend time in the small garden as well as on the beach. The welcome pack of yummy goodies was very much appreciated. Out of season Winter break at a pet friendly holiday home from home. Half Moon Cottage is ideally situated within a purpose built ‘New England’ style estate with a varied number of house types. Parking is adjacent to the house. 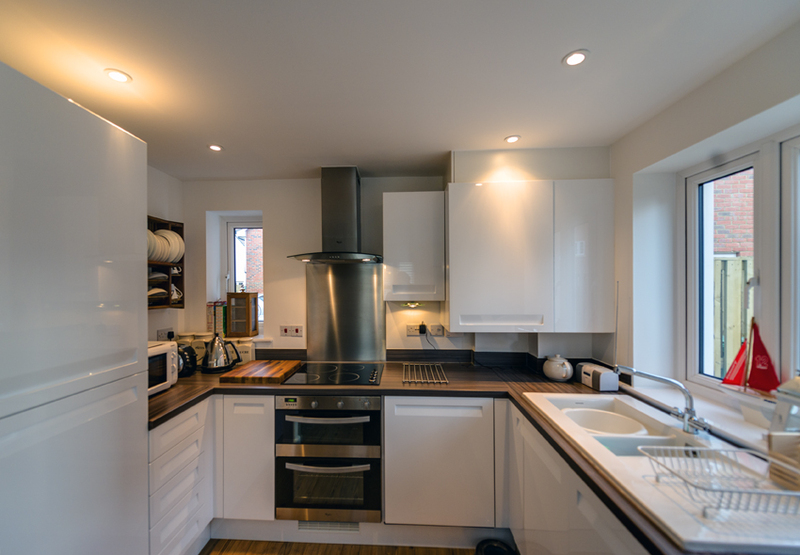 The house was very well presented, very clean, modern and was to a high standard. Very comfortable living room with lovely interior wooden window blinds to three sides. Modern kitchen with ample sized dining room table alongside which we tended to use of an evening to chill. Patio doors leading to an enclosed fenced ‘pebbled’ garden which was ideal for ‘Crumble’ (our very well behaved Cockapoo). Upstairs the bedrooms are of a good size and again well presented and comfortable. 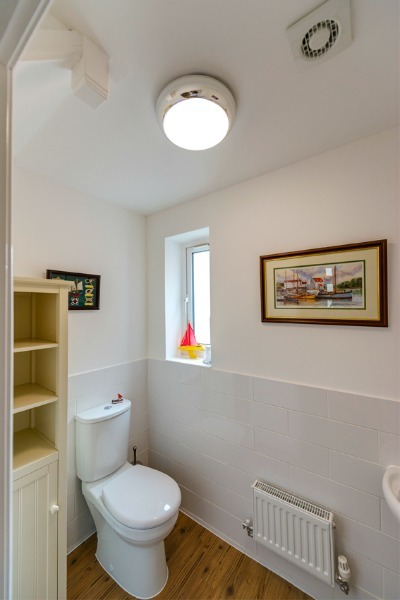 The en-suite in the main bedroom is compact but came in handy as our two adult daughters joined us for a couple of the days and ‘took over’ the main bathroom and bath! The house is presented with a ‘beside the sea’ decor throughout and we found it to be just what we needed as a home from home setting. The house/estate manager Richard was very friendly and professional when we had cause to seek help regards the internet connection as he was at the door to help before we had finished the phone call – good service and appreciated. Probably the best thing about the house/break was the fact the beach was about 5 minutes walk away; it was February yet we were VERY lucky and the weather for 5 of the days was lovely, fresh, clear and dry (one day wasn’t !! and we got very, very wet). We had not been to this beach before and it is stunning and has a bit of everything; sand dunes, soft sand, conservation areas the other side of the sea inlet and miles upon miles to walk with the dog. We are fortunate to have visited a lot of the coast around Britain over the years and Camber sands is without doubt one of the best beaches and coast line in the Country. We also visited Rye; Rye Harbour; Winchelsea Beach; Dungeness (not to everyones taste? Eclectic); Fairlight; Pett beach; Hastings and if you are really missing the shops there is Ashford designer Outlet about 40 mins away. We had a very enjoyable winter break and would recommend. We have a big family but half moon allowed for that. 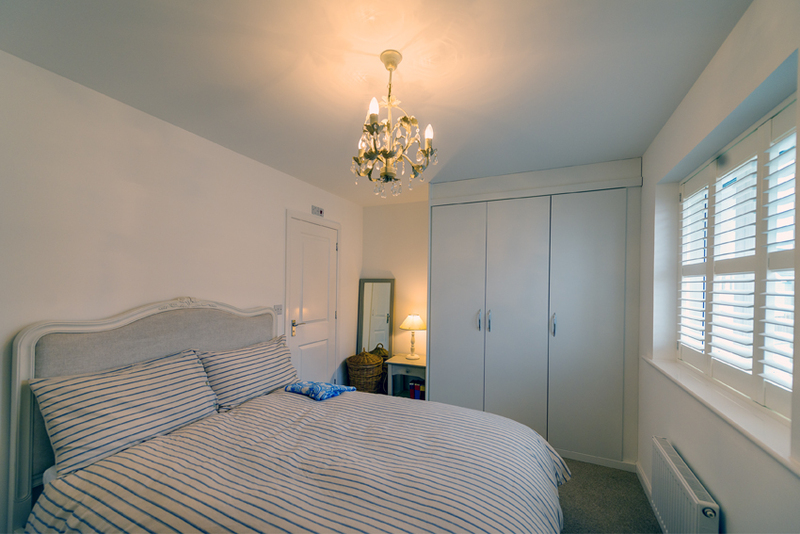 The cottage is beautifully furnished with everything you need for your stay. Even a stair gate and high chair were provided which made our stay a lot easier with my 18month old son. We came to celebrate my dad’s 70th birthday. Both my parents would agree that we had a weekend of luxury. They certainly enjoyed having an ensuite attached to the master bedroom. I have to say though my favourite part of the cottage was the garden which was surprisingly spacious. The children loved playing out there. Our spirits were lifted as soon as we walked through the door! 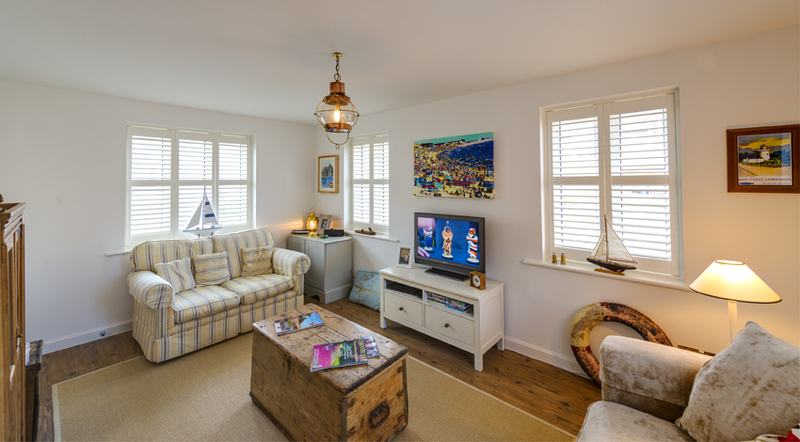 Half Moon Cottage is perfectly furnished and decorated for that seaside/nautical feel. 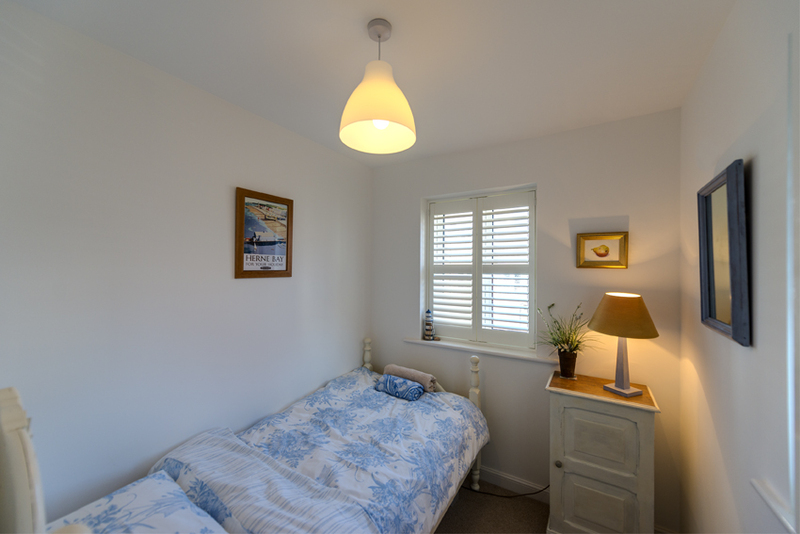 White Sands village as a whole is very ‘sea-sidey’ and charming, and Half Moon Cottage itself sits very well within this – it has a nice relaxed atmosphere – both light and airy but also very cosy in the evenings, when the lovely white shutters are closed at all of the windows. The kitchen/dining room is a great sunny spot (if you have the weather!) to sit and have breakfast overlooking the large private garden before going a walk on the long sandy beach, only 5 minutes away over the dunes. We soon discovered the cottage contains everything you could possibly want on a holiday – from board games, DVDs and plenty of books for those rainy days, to a hammock and barbecue in the garden for the sunny ones. Plus it’s always good to have wifi! 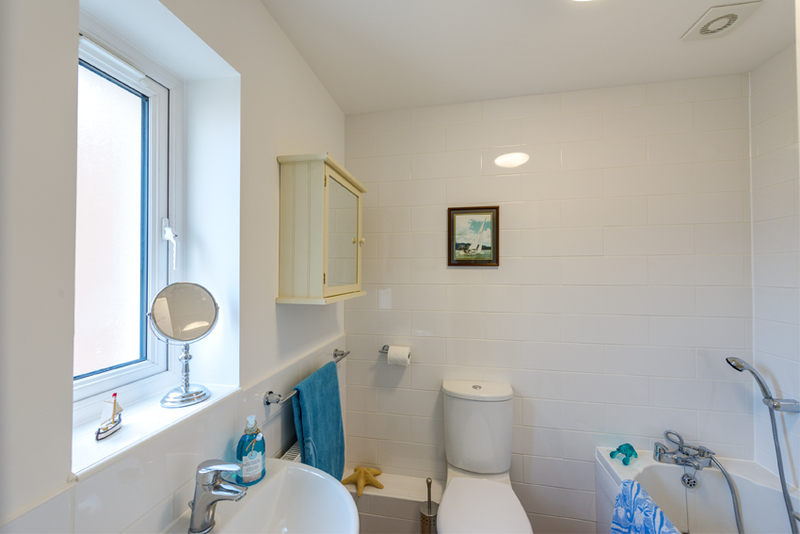 It was also great to have a family bathroom, en suite for the master bedroom and a downstairs cloakroom. There was plenty to do in the area, with the picturesque town of Rye only a short drive away. Here we found lots of restaurants, cafes (we loved Edith’s House and their resident French Bulldog) and antique shops for pottering. We also visited nearby Dungeness, which has a wonderful surreal atmosphere, and a long shingle beach – bleak and weird for brisk winter walks! 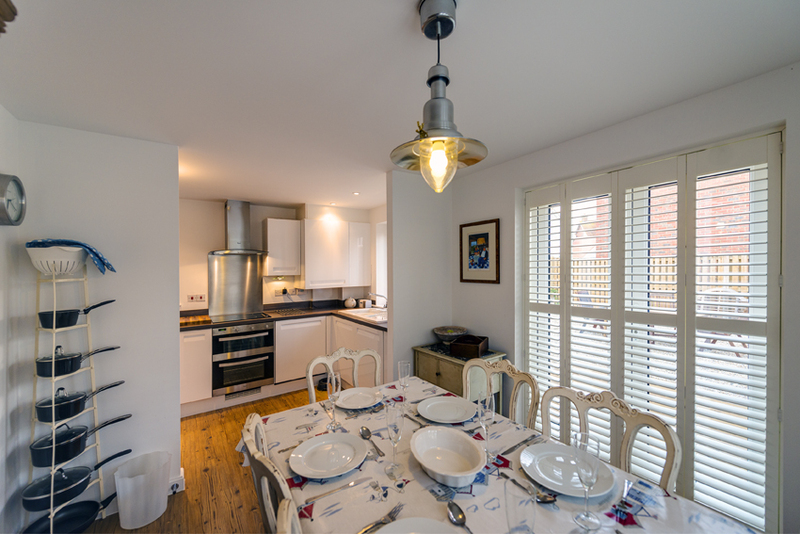 My husband and I stayed in Half Moon Cottage, Camber Sands for a weekend in December. The cottage itself was perfect: comfortable, warm and homely and had everything we needed. Its location was ideal for the beach – just across the road – which was great for our early morning run/walk – probably the best way to use the beach in December! The drive to Rye takes 5 minutes and we spent a very happy afternoon wandering in and out of the many independent shops followed by a well deserved (we thought) cream tea! We ate a wonderful dinner at The Beach Bistro – 5 min walk – and stumbled back in the cold to the welcome warmth of the cottage. I would highly recommend Half Moon Cottage and fully intend to return with my kids to try out the summer version! We have just returned from a excellent holiday at Half Moon Cottage – as soon as we arrived we knew we would enjoy it! 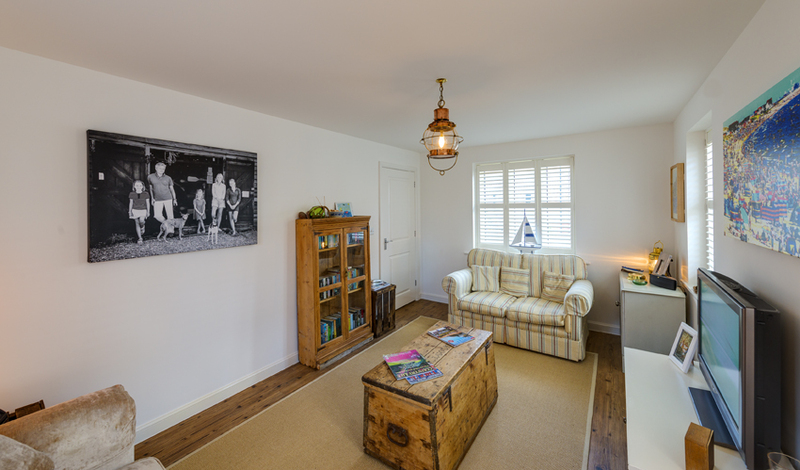 The cottage is beautifully furnished, spacious and comfortable with plenty of storage space (and an extra handshower over the bath!). We felt at home as soon as we arrived. Unfortunately the weather wasn’t very favourable but it was no hardship to relax in the cottage (books games and DVDs all provided) while waiting for the rain to stop so that we could enjoy the local walks, especially along the fabulous beach and visit the neighbouring towns, Rye and Battle were our favourites. There are plenty of good places to eat in the locality – the Bell in Iden particularly recommended and the local pub is well worth a visit. There is always something to do whatever the weather. Dear Richard, thanks again for recommending this splendid cottage – the initial wait was more than worth it. We spent 2 fantastic weeks in Camber sands with the family and we absolutely loved it! We have enjoyed the sun and the beach, have visited nearby bodiam castle, hastings and sissinghurst and of course rye. We have also done two trips to London (via high-speed from Ashford) – for all these different activities the cottage is situated ideally and we would highly recommend it to anyone interested in spending time in this region.